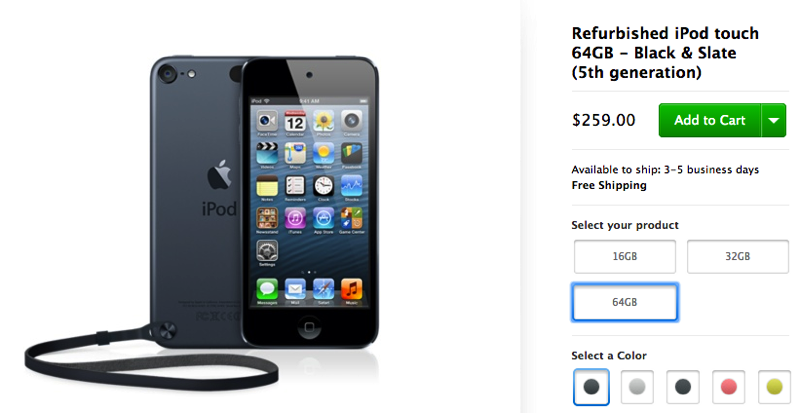 If you’ve been waiting to jump on an Apple.ca refurbished iPod touch with higher capacity storage, the 64GB model in Black & Slate is back in stock, priced at $259, a savings of $60 versus buying brand new (19% off). This fifth generation iPod touch was released back in 2012 and has a 4-inch Retina display, A5 chip plus a 5MP iSight camera. All refurbished iPods come with a one year warranty and are usually good as new, minus the shiny box. While this unit is aging, it still might make a decent gift for casual users such as kids for light gaming and watching videos. Let us know if you’re going to jump on this (it’ll probably sell out quickly).